iOS includes the Reminders application, the purpose of which was to allow users to specify events about which they wished to be reminded. Reminders can be specified for a specific date and time, or even to be triggered when the user either arrives at or leaves a specified location. You might, for example, use the Reminders app to remind you to buy milk on your way home when your iPhone or iPad detects that you are leaving your office. Using the Event Kit Framework, it is possible to create and manage these reminders from within your own applications. This chapter will cover some of the basics of calendars and reminders before working step-by-step through the creation of an example application that demonstrates the creation of both date and location based reminders. The Event Kit Framework consists of a range of classes designed specifically to provide access to the calendar database and to facilitate the management of events, reminders and alarms. In terms of integrating reminders into an iOS application, these classes are EKCalendar, EKEventStore, EKReminder and EKAlarm. The EKEventStore class provides an interface between applications and the underlying calendar database. The calendar database can, in turn, contain multiple calendars (for example the user may have a work calendar and a personal calendar configured). Each calendar in a database is represented in code in the form of an EKCalendar object. Within each calendar there are events and reminders, each of which is managed in code using the EKEvent and EKReminder classes respectively. Finally, the EKAlarm class is used to configure alarms to alert the user at a specified point in the future. 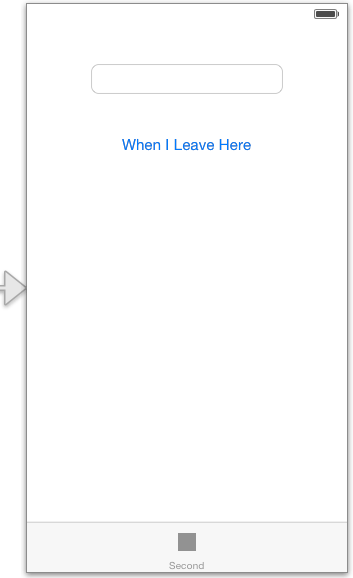 In order to work with reminders in an iOS application, an instance of the EKEventStore class must be created. It is important to note that there is system overhead in requesting access to the calendar database so the call to initialize an EKEventStore object should ideally only be performed once within an application. In some situations, the system will prompt the user to allow the application access to the calendar. As such, the EKEventStore object should only be initialized immediately prior to the point in the code where calendar access is required. A reference to this event store object should then be retained and used for future calendar interaction throughout the lifespan of the application. Once access has been accepted or denied by the user, the privacy setting for that application can be viewed and changed within the Privacy section of the Settings application. 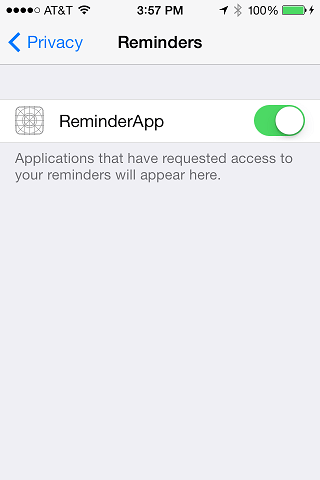 Figure 73 1, for example, shows that the access for an application named ReminderApp to Reminders on the system is currently disabled. In addition, it is worth noting that the message used by the system to request access to the calendar database can be configured by adding an entry to the Info.plist file for the project. By default a message similar to that illustrated in Figure 73-2 will be displayed. By editing the Info.plist file, for example, and adding a “Privacy – Reminders Usage Description” key and value, the message may be augmented to provide the user with additional information as to why access is required. Once defined, the custom message will appear when access is requested from the user. The Event Kit framework has the concept of a default calendar for the addition of new reminders and events. This default calendar may be configured by the user within the Settings app on the device (Settings -> Reminders and Settings -> Mail, Contacts, Calendars). These are represented in code by the defaultCalendarForNewReminders and defaultCalendarForNewEvents constants. Whilst some applications may need to let the user choose which calendar to use, these defaults can be useful when selection is not necessary. predicateForIncompleteRemindersWithDueDateStarting - Searches for incomplete reminders specified between optional start and end dates. predicateForCompletedRemindersWithCompletionDateStarting: - Searches for completed reminders between optional start and end dates. New reminders are added to the calendar by creating new instances of the EKReminder class, configuring the object according to the requirements of the reminder and then adding it to the event store. The above code creates a new EKReminder object and, in so doing, associates it with the event store before setting the title of the reminder. Next, the reminder is configured so that it will be added to the user’s default reminder calendar before being saved to the event store. Reminders can be general as in the above example or, as will be demonstrated in the following tutorial, configured to be triggered at a specific date and time, or when the user arrives at or departs from a physical geographical location (a concept known as geofencing). The EKAlarm class can be used to add an alarm to the reminder. Alarms can be specified either using a specific date and time (via a call to alarmWithAbsoluteDate: and passing through an NSDate object) or using a relative time interval (via a call to alarmWithRelativeOffset: passing through an NSTimeInterval value). Once an EKAlarm object has been created and configured it must be added to the EKReminder object with which the alarm is to be associated. When the specified time arrives, the user will be notified of the reminder with sound, vibration and a notification panel. Begin by launching Xcode and selecting the options to create a new iOS application based on the Tabbed Application template. Enter ReminderApp as the product name and class prefix and set the device to iPhone. In the remainder of this chapter, an application will be constructed designed to allow the user to add reminders based on either date/time or location factors. Select the Text Field object and display the Assistant Editor using View -> Assistant Editor -> Show Assistant Editor menu option, making sure that it is displaying the content of the ReminderAppFirstViewController.h file. If it is not, click on the file name in the bar at the top of the Assistant Editor panel and select the file from the drop down menu. Ctrl-click on the Text Field object in the view and drag the resulting line to the area immediately beneath the @interface directive in the Assistant Editor panel. Upon releasing the line, the configuration panel will appear. Configure the connection as an Outlet named reminderText and click on the Connect button. Repeat this step to add an outlet connection to the Date Picker object named myDatePicker. Finally, Ctrl-click on the Button object, drag the line to the Assistant Editor and release it beneath the last outlet connection added. In the resulting connection panel, change the connection type to Action and name the action setReminder. The createReminder method creates a new EKReminder object associated with the event store and sets the title property to the content of the Text Field object in the user interface. The code elects the default calendar as the target for the reminder and then creates an EKAlarm object primed with the date value selected by the user in the Date Picker object. The alarm is then added to the reminder which, in turn, is saved in the event store. Errors are output to the console for debugging purposes. With the time and date based reminder phase of the application completed, the next step is to implement the location based reminder functionality. 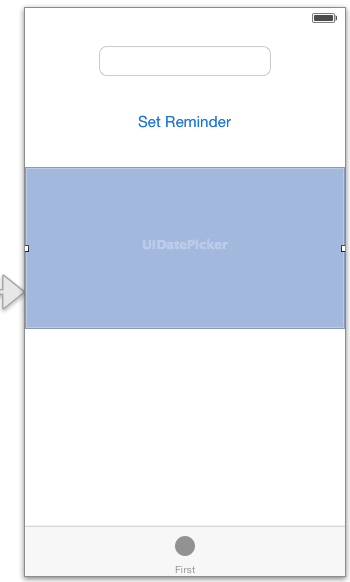 The tab controller created on our behalf by Xcode contains a second view that will be used for the location based reminder creation. The goal of this view will be to allow the user to specify a reminder and alarm that will be triggered when the user moves away from the geographical location at which the reminder was created. Begin by selecting the Main.storyboard file and locating the second view controller scene. Remove the template label and text view added by Xcode and design a new user interface using a Button and a Text Field as illustrated in Figure 73-4. Using the Assistant Editor (taking care to ensure that that editor displays the code for the ReminderAppSecondViewController.h file not the file for the first view controller), establish an outlet connection for the Text Field named locationText. Next, establish an Action connection from the button to a method named setLocationReminder. Since this code introduces some new concepts a more detailed breakdown is probably warranted. To begin with, the code stops the location manager from sending further updates. Next, a new EKReminder instance is created and initialized with the text entered by the user into the Text Field. The default calendar is selected to store the reminder and then an EKStructuredLocation instance created with a location title of “Current Location”. 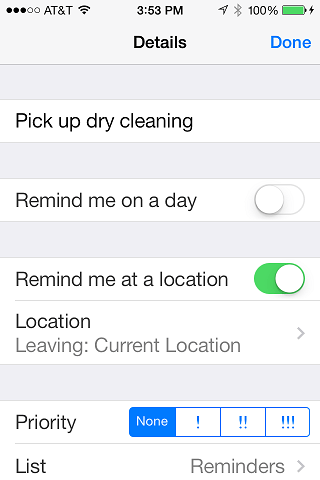 This is the title by which the location will be listed in the Reminders app. The most recent location from the location update is extracted from the end of the locations array (see chapter Getting Location Information using the iOS 7 Core Location Framework for more details on location awareness) and the coordinates assigned to the EKStructuredLocation object. Finally, the fully configured reminder is saved to the event store. Since the application will rely on a default calendar having been designated for reminders, the first step is to make sure this has been configured. Launch the Settings application, scroll down to and then select Reminders, and make sure that a calendar has been assigned to the Default List. Compile and run the application on a physical device (reminders do not currently work on the iOS Simulator). Select a time a few minutes into the future, and enter some text onto the first screen before touching the Set Reminder button. Put the app into the background and launch the built-in Reminder app where the new reminder should be listed in the default reminder list. When the designated time arrives the alarm should trigger, displaying the text entered by the user. When you next leave your current location the alarm should trigger. The Event Kit Framework provides a platform for building reminders into iOS application. Reminders can be triggered based on either a date and time or change of geographical location. This chapter has provided an overview of Event Kit based reminders before working through the creation of an example application.